I also know I’m not alone in having put it off for a while, even though the very act of writing makes my heart sing. What is it about us humans that makes us so resistant to doing what we love and putting ourselves out there in written form? Even when the very act of resistance makes us feel rubbish about ourselves daily? It is of course, our old friend Fear. Alongside his buddy, Ego. Those little tinkers sneak in every time we dare to do something different. Which is why we need a set of simple strategies based on facts. Fear loses out when your facts are right, because he can’t argue with logic…not when he’s built on lies and make-believe. I’m sharing this because it’s important for all those ‘books in waiting’ to be written, published and shared with the world. Fear is responsible for too many wonderful works of art staying hidden, so having learned how to transcend it, it’s only fair I share some facts with you, so that you can transcend fear too — leaving Ego to sit quietly in the corner playing nice. The results so far have been amazing..
At the time of writing, I’ve reached 305 pre-orders in 27 days; despite having less than 3 weeks lead-in time, a small list, a small online platform (because I’ve worked 1:1 in person for 12 years), and a number of things already scheduled in my personal life that meant I wouldn’t be able to pre-plan or be online a lot of the time whilst the campaign ran. Pre-orders have mostly come from individuals ordering one book — generally people I know well. I’ve also had a few people order bigger packages- the biggest gesture of support came from an entrepreneur who believed in my mission so much that he pre-ordered 100 books to distribute in his organisation. I was also privileged to have support from an extremely generous philanthropist, who resonated with my mission so much he donated 50 books for me to share with women’s groups. It’s nothing short of magical! I share this not to brag, but to inspire you all — because if I can do this, anyone can. Your inner champion is ready and you’ve got this. I wanted to take my mission-led message into the world in a bigger way and as writing is the thing I do without thinking about it, it’s always been my dream to build out my heart-centred business around writing one day; self-publishing is an option, but having a publisher gives me access to other channels of communication. 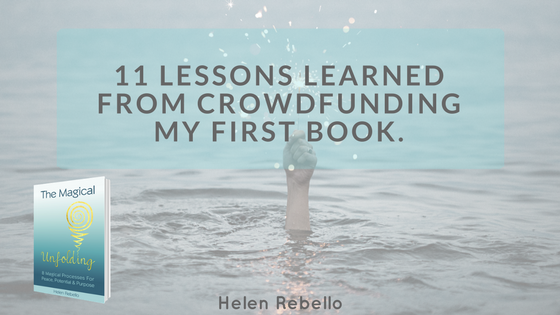 With a relatively small online presence, traditional publishers will be reluctant to consider me — but crowdfunding gives me an opportunity to prove people are interested in what I have to say. Publishizer were my first choice and I highly recommend them — Lee Constantine especially. 1. Setting a very clear vision & sticking to it No Matter What is important. My 2017 plan revolved around ‘Find a publisher by Dec 2017’ — which means I’ve been open to what moves me closer & not overly distracted by what doesn’t. 3. Taking action on your vision by sharing your Why with your people, creating personalised videos and messages, and asking for support from your heart, will garner you more support and shares than you could ever possibly imagine. 4. People want other people to succeed and they want to contribute to the mission by supporting them. They are especially drawn to helping you if you’ve worked with them, know them or have connected with them in person — online connections are wonderful too — but they mean far more when you take them offline. 5. When reaching out to someone personally, approach it from the perspective of what your mission has in common with theirs — and be brave about who you approach. A NO doesn’t hurt you — but a yes might change everything. 6. Never underestimate the power of reminders and nudges. People are busy and just because they forget to share or support you, it doesn’t mean they don’t want to. Life just got in the way and they don’t mind being reminded — in fact some people thanked me for the nudge! 7. Don’t use pre-formatted emails or sales pitches that aren’t written by you — people will see through it, you’ll regret it and whilst you’ll sell stuff, you won’t stick in people’s hearts as well as their minds. 8. Lean into trust. Less hustle, more flow. Every time I pushed, the orders stopped. When I eased back they flowed again. 9. Be grateful — I am grateful for every single client I’ve had and each person that believes in my ability to empower them; that has helped me stay grounded throughout this process. When I talk to people about my book, they can see how moved I am by the work I do — it helps that I’ve never taken my clients for granted and I’m genuinely grateful for everyone in my tribe. Your tribe may be small too — but in my case, it’s still just under 400 unique, once in a lifetime souls, that I am privileged enough to have believing in me. 10. Don’t let anyone tell you that dreams cannot be achieved if you don’t conform to the usual methods. I’ve out-performed people with big lists, books already published, who had more lead-in time and used FB ads (I know this from 1:1 conversations with authors!). I’m genuine and walk my talk — this counts for more than you expect. 11. Finally, please know that you’ll never feel ready and you’ll never know what you’re capable of achieving until you try. Don’t let Fear and Ego lead the way — listen to your inner call and just start. Use these fact-based strategies to help you! When all else fails, repeat the mantra: ‘my mission is bigger than my fear’! You can see my campaign and how I’ve structured it here. 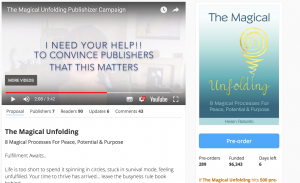 If you’d like a copy of The Magical Unfolding once it is published, be sure to sign up for newsletters to keep up to date with my book publishing journey! This blog was first published on The Tranquil Path website. You may also be interested in reading an excerpt from The Magical Unfolding.